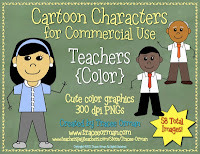 Mrs. Orman's Classroom: New Cartoon Character Clip Art for Commercial Use! 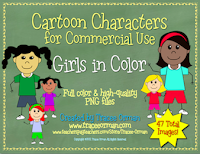 New Cartoon Character Clip Art for Commercial Use! 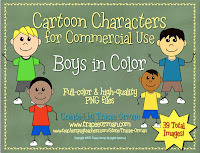 I'm so excited to share my new cartoon character clip art figures with you! I have been attempting to make these for over a year now, and I finally got some time this summer to complete them. 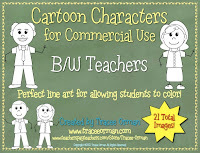 Many teachers had requested figures in both color and black and white line art. Another request was to show diversity in order to represent all our students in our classrooms. Click on the images to see the full product listings. I hope you enjoy my children and teachers (the teachers could be any adult professional). 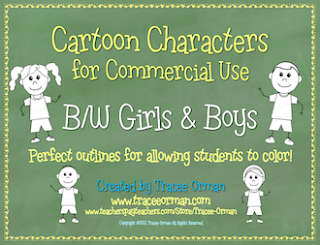 All of my graphics can be used for commercial purposes, as well as educational and personal use, of course. I only ask for a link to this site or my teacher's store in return for the commercial use. I don't charge a fee or a license.